If you’re anything like us, you think of 28 Days Later as a London movie. After all, it contains some of the most striking and memorable images of our fair city in recent memory. You may be surprised to find, as we were when re-watching the film recently, that less than half of the film takes place in London. We know! Surprising, right? 28 Days Later begins with activists attempting to save chimpanzees from a primate research lab in Cambridge. It all goes horribly wrong though, when they learn that the chimps are infected with rage. Cut to 28 days later, in a London hospital. Jim (the very pretty Cillian Murphy), a courier, wakes up naked and alone to find the hospital abandoned. After grabbing some scrubs, he makes his way out of the hospital and heads into central London to try and find out what has happened. The next scenes are absolutely the most striking and memorable scenes in the movie. Jim wandering through an empty and abandoned London is visually stunning and seems almost impossible. It’s hard to believe that, although this section is absolutely the most memorable in the film, it’s less than 5 minutes long. Jim walks through deserted London, across Waterloo and Westminster bridges, past the London Eye, St. Paul’s and the Southbank lion, through the City, and past dozens of other London sites. A copy of the Evening Standard tells him that London has been evacuated. At the abandoned Piccadilly Circus, he finds thousands of missing person posters. And then he finds out why London’s been evacuated. In an abandoned church, Jim is attacked by a zombie priest. Okay, we know they don’t actually call them zombies, and they’re a little faster moving and bloodier than your typical zombies, but really, isn’t that what they are? Lucky for Jim, he meets up with fellow survivors Selena and Mark. They kill the zombies chasing him with a very effective explosion and take him to their hideout in a tube station. It wasn’t immediately recognizable to us, but we hear a rumor it’s Canary Wharf station and we have no reason to disbelieve that. It did cross our minds that it seems unlikely the tube lines wouldn’t be filled with the zombies, we’ll assume there’s some logical reason for that. Mark and Selena give Jim the lowdown on what’s happened - the rage spread from the chimps to people and spread throughout the whole country in a matter of days. There’s no government, there’s no police, no military and basically no hope. Despite Selena and Mark’s protests, Jim insists on finding out what happened to his parents, and the three of them make the trek across the river to Deptford the following day. There, Jim finds the sort of good news that his parents weren’t turned into murderous monsters, but instead killed themselves. Jim’s rookie mistake with a candle gets Mark infected, which in turn gets him killed by Selena. Now on their own, Selena and Jim find another pair of survivors. Hannah and her father Frank have been hiding out in a tower block, and they convince Selena and Jim to follow a radio signal that leads them to believe help will be available just north of Manchester. They have a little incident in a tunnel (which we would probably recognize if we drove, but suspect to be the Blackwall Tunnel) with a flat tyre and a horde of rushing zombie, but manage to escape the city in Frank's black cab with just one quick gleeful spree at an abandoned Budgens before they leave. Then the rest of the movie happens. It’s all soldiers who aren’t what they seem and people falling in love despite hideous circumstances. And, of course, zombies. But don’t you worry, most of the characters survive intact. But it all happens outside of London, so it's really not our concern. 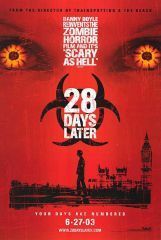 28 Days Later is a great zombie movie and a great London movie. It’s far from perfect, but really what film is? We fully recommend it. London Icons Spotted: Pretty much every one you can imagine in central London. It’s good that way. Glaring London Errors: We’re willing to let a few minor geography errors slide, but Jim’s a bicycle courier? When was the last time you saw any bike couriers in London? Motorcycle courier is a lot more likely. Things They Got Right: We’ve never been in a post-apocalyptic London, so it’s hard to say, but we really liked that the survivors basically lived on cans of Pepsi and bags of Maltesers.